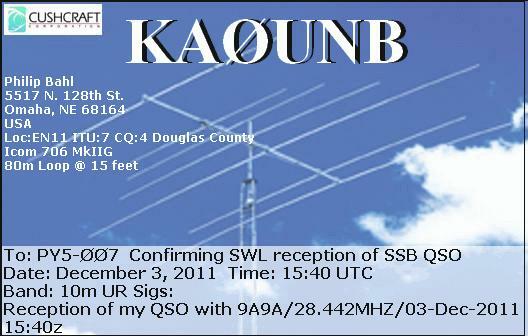 eQSL recebido: KA0UNB, Omaha, NE, United States, 28 MHz, QSO w/ 9A9A. 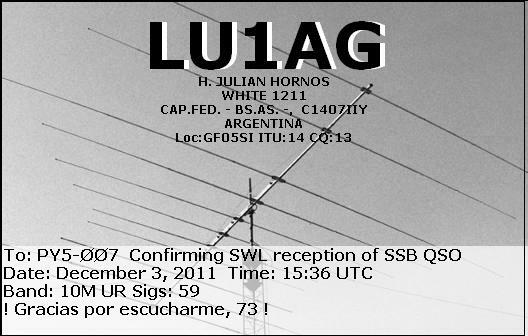 eQSL recebido: LU1AG, Buenos Aires, República Argentina, 28 MHz, QSO w/ 9A9A. 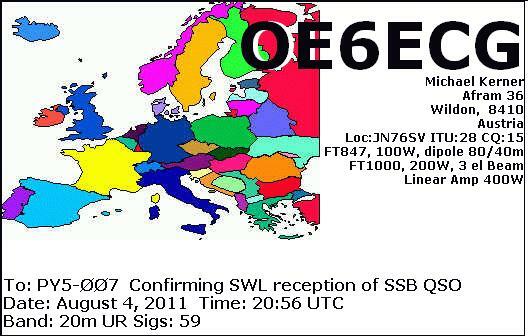 eQSL recebido: OE6ECG, Wildon, Áustria, 14 MHz, QSO w/ PY6RT. 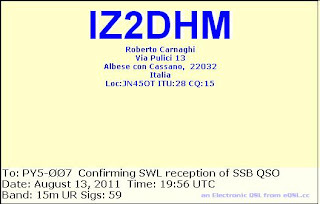 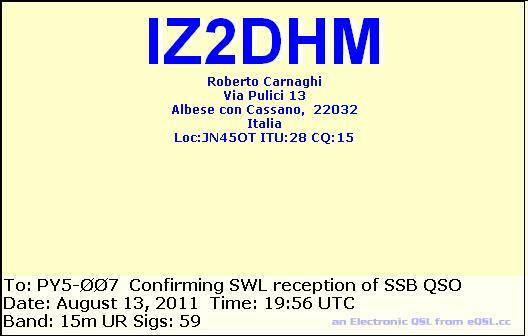 eQSL recebido: IZ2DHM, Albese con Cassano, Italy, 21 MHz, QSO w/ LU7MSE. 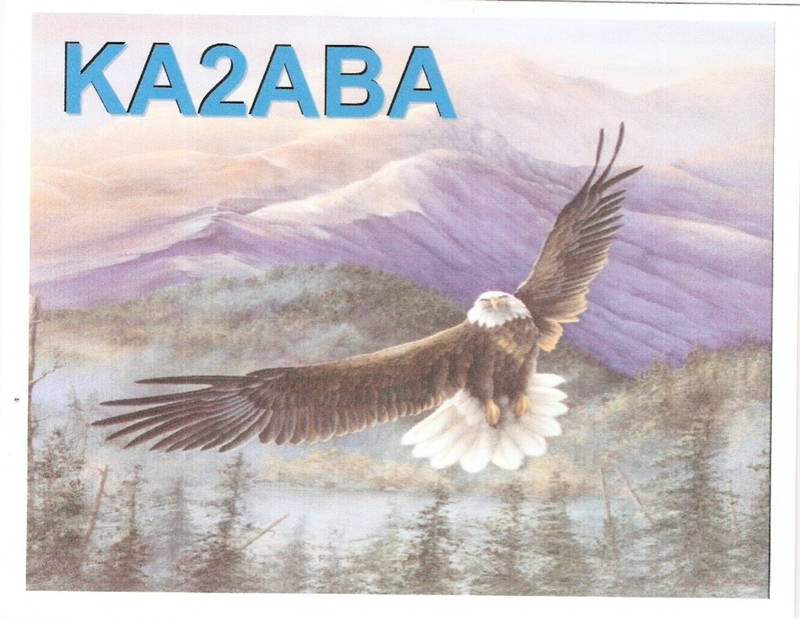 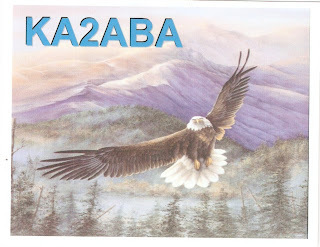 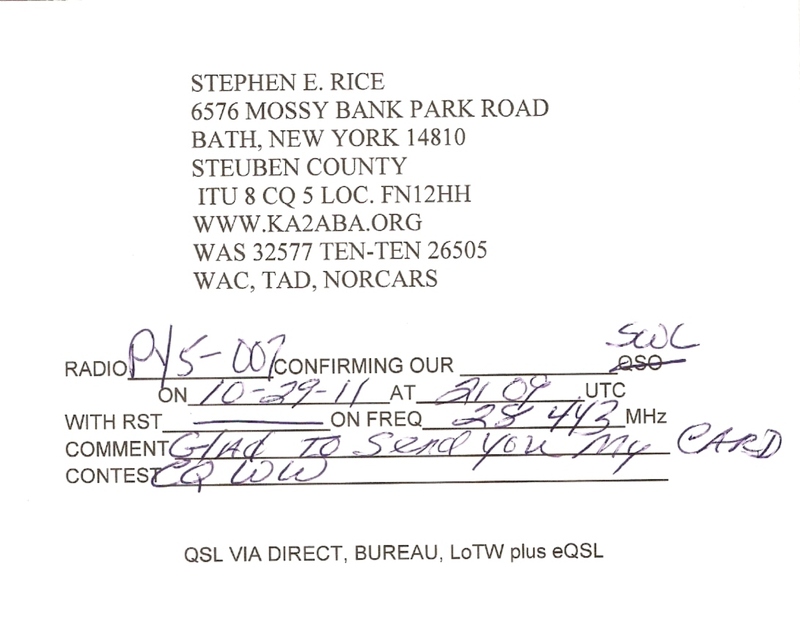 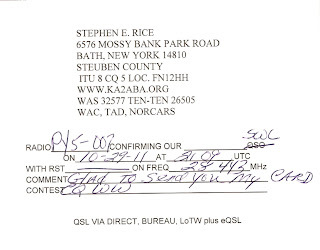 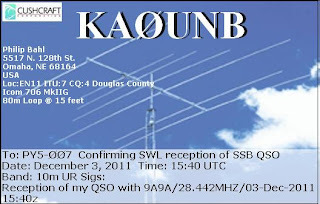 Cartão QSL recebido: KA2ABA, Bath, New York, United States, 28 MHz, QSO w/ AY5F (Contest CQWW). 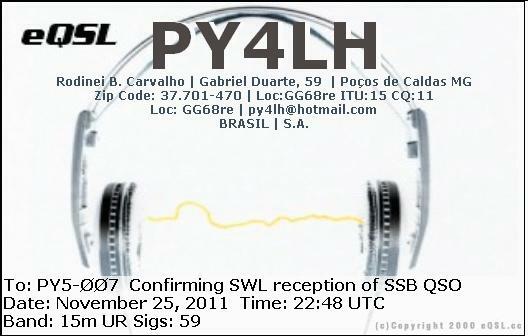 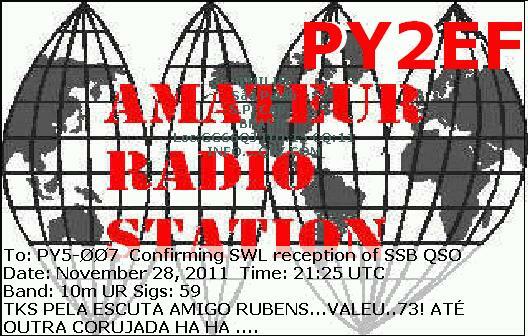 eQSL recebido: PY2EF, Sãp Paulo, SP, Brasil, 28 MHz, QSO w/ 9L0W. 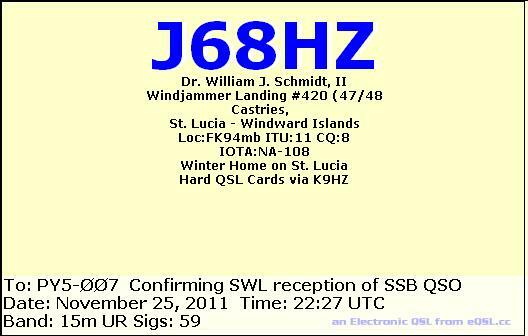 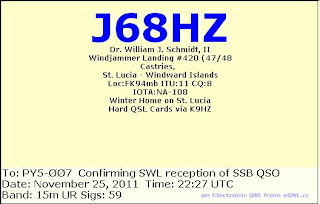 eQSL recebido: J68HZ, Castries, Saint Lucia, 21 MHz, QSO w/ JE1LET, CX8BU. 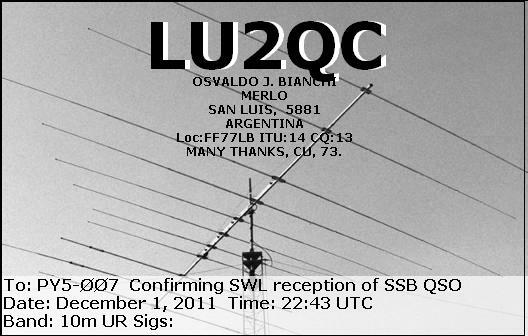 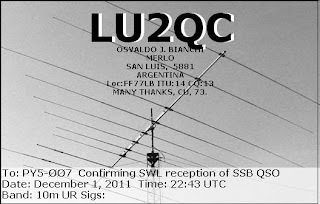 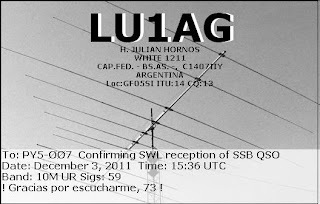 eQSL recebido: LU2QC, San Luís, República Argentina, 28 MHz, QSO w/ N4DG, N0MM. 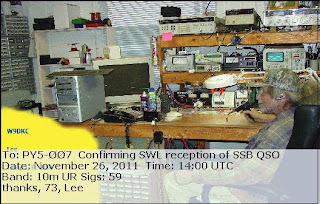 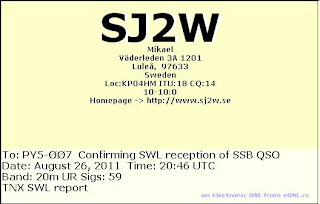 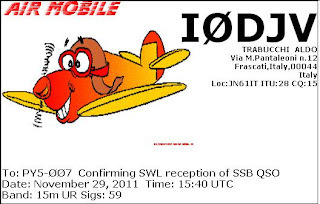 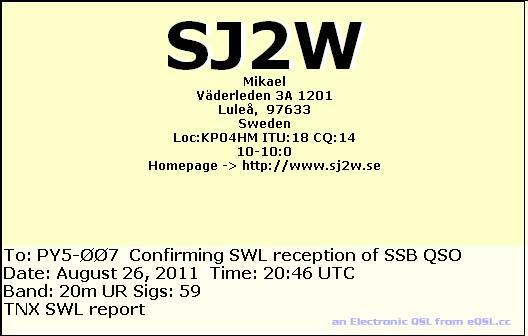 eQSL recebido: SJ2W, Lulea, Sweden, 14 MHz, QSO w/ PY6RT. 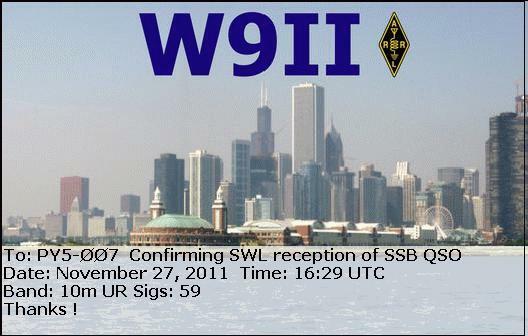 eQSL recebido: W9II, Rolling Meadows, IL, United States, 28 MHz, QSO w/ EA9IE. 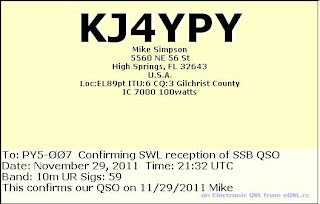 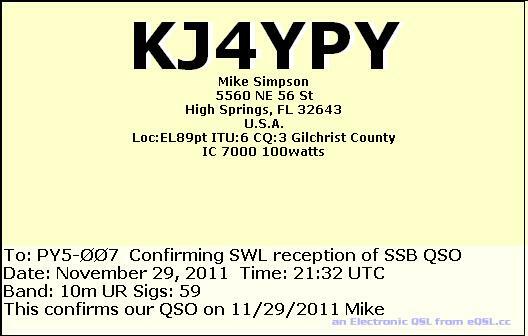 eQSL recebido: KJ4YPY, High Springs, FL, United States, 28 MHz, QSO w/ PJ7TM. 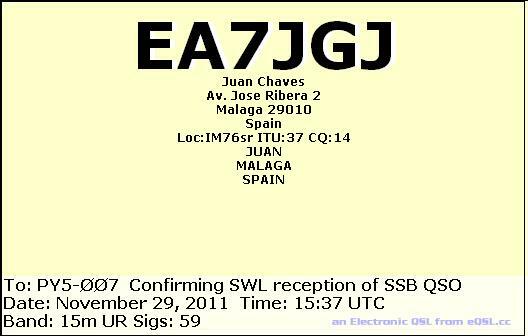 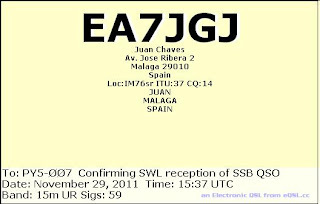 eQSL recebido: EA7JGJ, Malaga, Spain, 21 MHz, QSO w/ 9L0W. 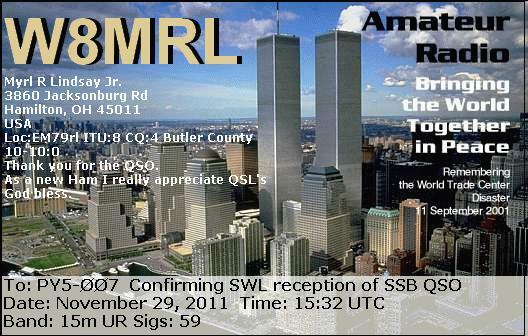 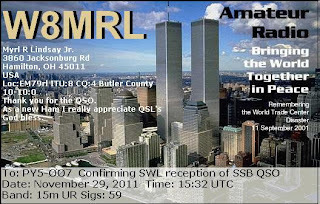 eQSL recebido: W8MRL, Hamilton, OH, United States, 21 MHz, QSO w/ 9L0W. 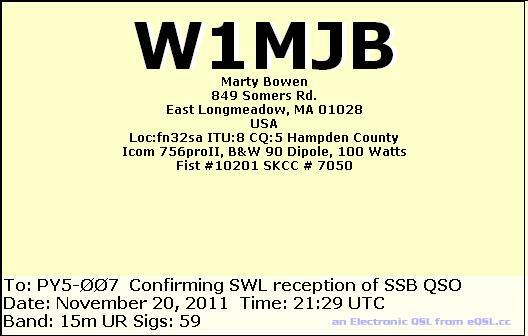 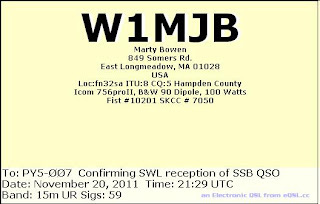 eQSL recebido: W1MJB, East Longmeadow, MA, United States, 21 MHz, QSO w/ KT0R. 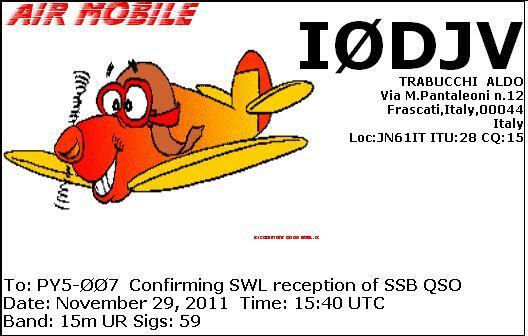 eQSL recebido: I0DJV, Frascati, Italy, 21 MHz, QSO w/ 9L0W. eQSL recebido: PT9KGB, Campo Grande, MS, Brasil, 28 Mhz, QSO w/ PP5BS. 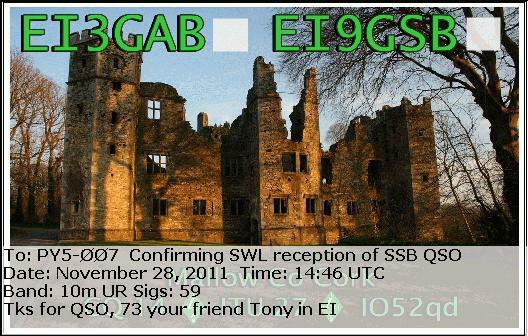 eQSL recebido: EI3GAB, Mallow, Co Cork, Ireland, 28 MHz, QSO w/ HP1DSD. 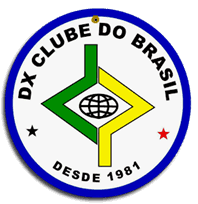 eQSL recebido: PY4LH, Poços de Caldas, MG, Brasil, 21 MHz, QSO w/ J68HZ. eQSL recebido: WX4US, Pensacola, FL, USA, 28 MHz, QSO w/ PA3GSU. 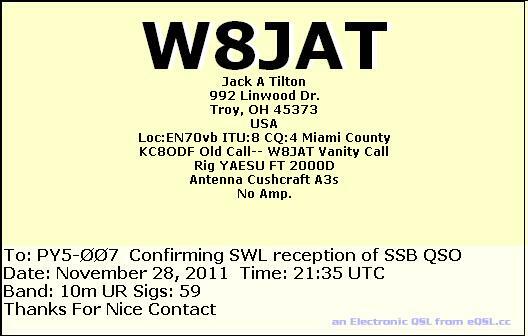 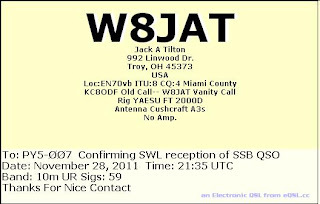 eQSL recebido: W8JAT, Troy, OH, USA, 28 MHz, QSO w/ 9L0W. 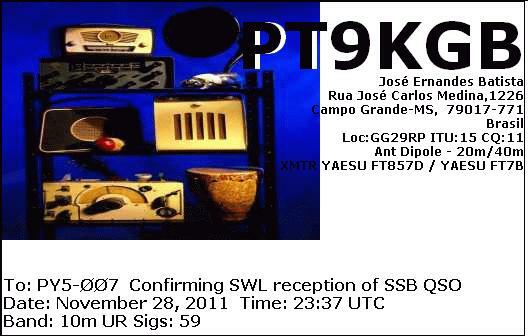 eQSL recebido: PA3GSU, Gerkesklooster, 28 MHz, QSO w/ PU2WTO, PI4XUI, KT4NY, KF3T, KB1WIQ/P, etc. 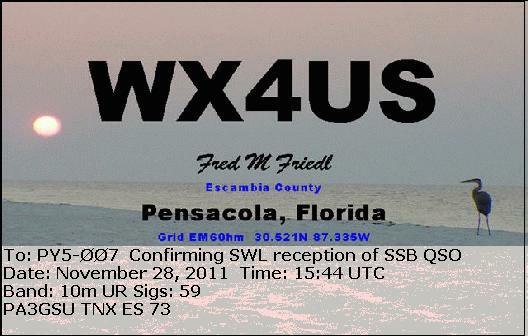 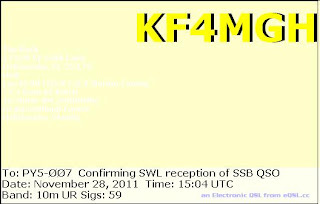 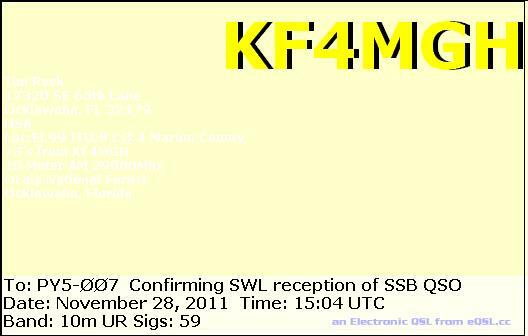 eQSL recebido: KF4MGH, Ocklawaha, FL, United States, 28 MHz, QSO w/ PA3GSU. 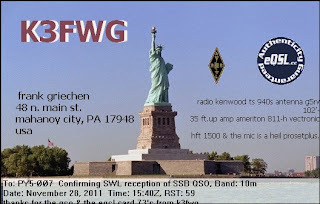 eQSL recebido: K3FWG, Mahanoy City, PA, United States, 28 MHz, QSO w/ PA3GSU. 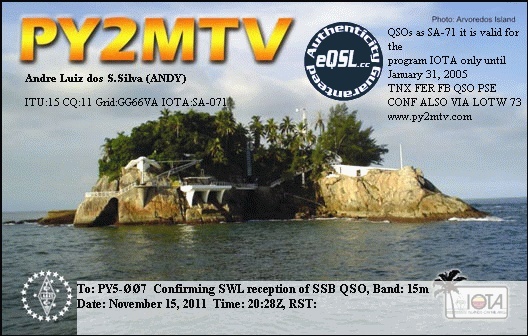 eQSL recebido: PY2MTV, Guarujá, SP, Brasil, 21 MHz, QSO w/ A61BK. 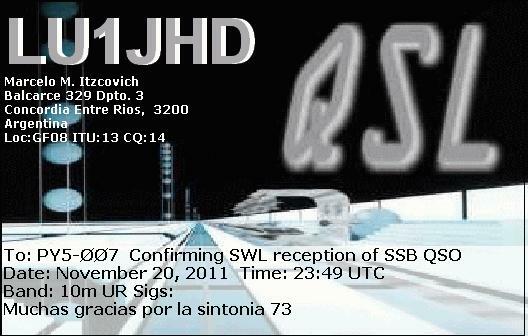 eQSL recebido: LU1JHD, Concordia, Entre Rios, República Argentina, 28 MHz, QSO w/ PU5RDA. 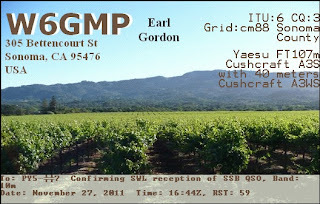 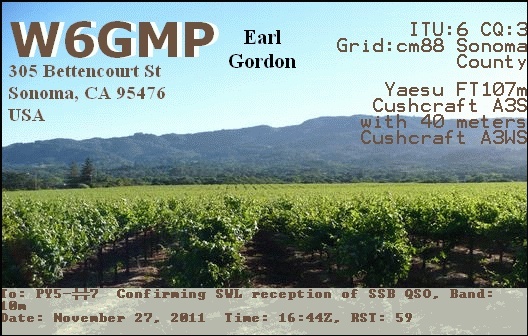 eQSL recebido: W6GMP, Sonoma, CA, United States, 28 Mhz, QSO w/ EA9IE. 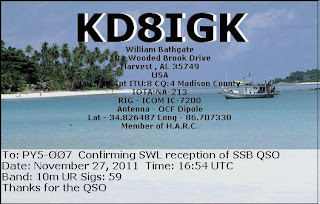 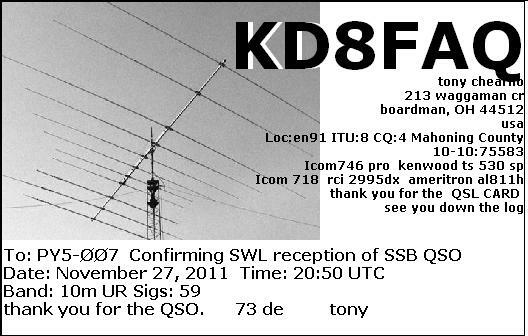 eQSL recebido: KD8FAQ, Boardman, OH, United States, 28 MHz, QSO w/ LW2DY. 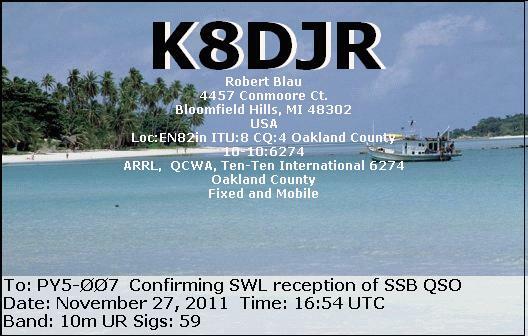 eQSL recebido: K8DJR, Blomfield Hills, MI, United States, 28 MHz, QSO w/ EA9IE. eQSL recebido: HI7JJO, La Romana, Dominican Republic, 28 MHz, QSO w/ EA9IE. 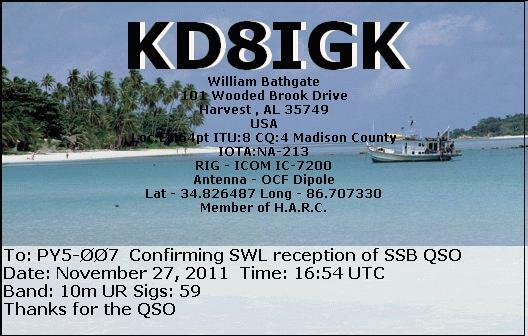 eQSL recebido: KD8IGK, Harvest, AL, United States, 28 MHz, QSO w/ EA9IE. 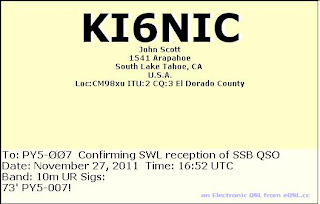 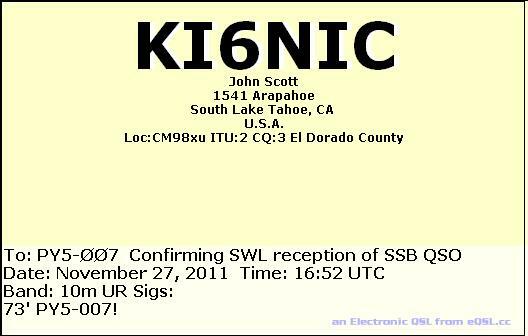 eQSL recebido: KI6NIC, South Lake Tahoe, CA, United States, 28 MHz, QSO w/ EA9IE. eQSL recebido: LU1AG, Buenos Aires, República Argentina, 28 MHz, QSO w/ EA9IE. 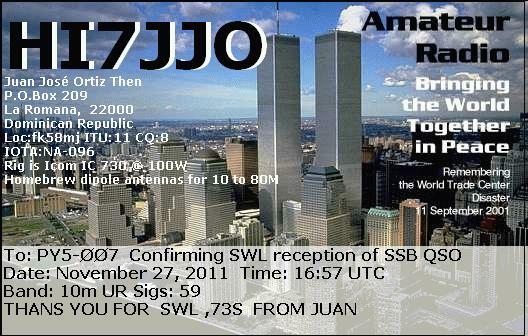 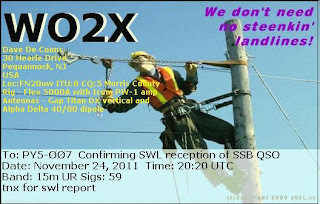 eQSL recebido: WO2X, Pequannock, NJ, United States, 21 MHz, QSO w/ C91NW. 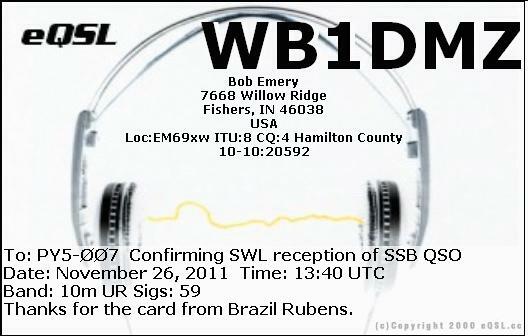 eQSL recebido: W9DKC, Tampa, FL, United States, 28 MHz, QSO w/ OK2BGW. 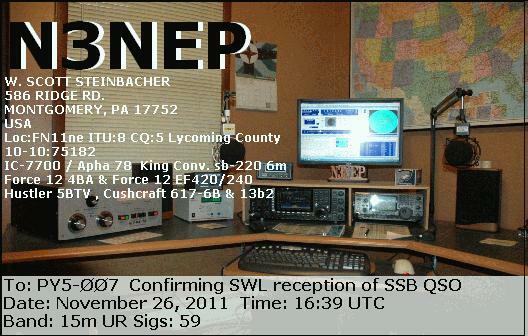 eQSL recebido: N3NEP, Montgomery, PA, United States, 21 Mhz, QSO w/ GD6IA. 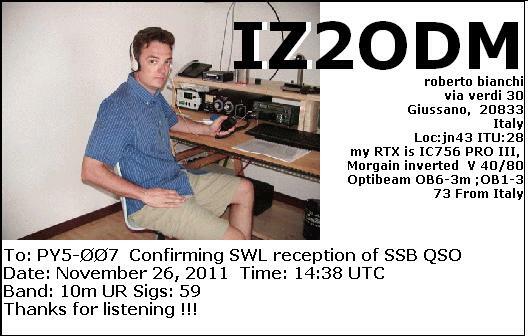 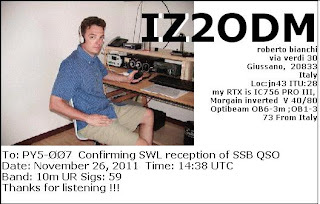 eQSL recebido: IZ2ODM, Giussano, Italy, 28 MHz, QSO w/ LU2/DL3KZA. eQSL recebido? WB1DMZ, Fishers, IN, United States, 28 MHz, QSO w/ OE3WMA. 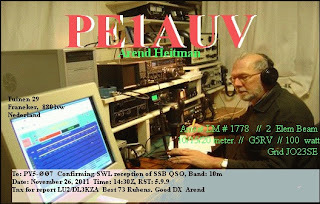 eQSL recebido: PE1AUV, Franeker, The Netherlands, 28 MHz, QSO w/ LU2/DL3KZA.